Absolutely fun set of 5 handmade, upcycled gift tags to decorate your kid's Birthday Presents. Is Spongebob your kid's favorite Nickelodeon character? or maybe Patrick or Sand Cheeks? If yes then this would be the perfect embellishment for those treasured packages. 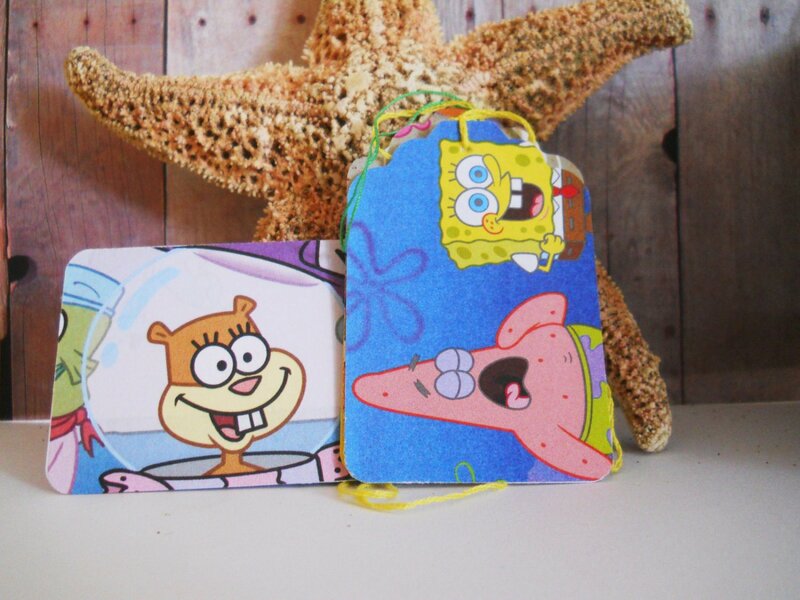 Set of 5 Handmade gift tags, capturing the characters from Nickelodeon's very own Spongebob Squarepants and Friends. Images on one side different Characters and scenes and the other side white card-stock on the other so you can personalize. Each are 2 3/4 tall x 1 3/4 wide. These tags are upcycled from books that have been rescued and would have been discarded due to significant damage, scribbles, or wear.